Monday 11 June - a Symposium entitled “Belgian Gastronomy Today” under the high patronage of the European Parliament, to promote the culinary talent of the Kingdom as well as the Belgian contribution to the gastronomy of the European Union and the World. Tuesday 12 June - a Gala dinner under the high patronage of Mr. Didier Reynders, Deputy Prime Minister and Minister of Foreign Affairs on the occasion of the 80th anniversary of the Royal Club of Gastronomes in Belgium (1938-2018). To celebrate Belgian Gastronomy and its 80th anniversary, the Royal Club of Gastronomes in Belgium, selected three renowned Belgian chefs, one from each region of the Kingdom. From Flanders, Tim Boury, was elected by Gault & Millau, Chef of the year 2017 and was awarded a second Michelin star in 2018. 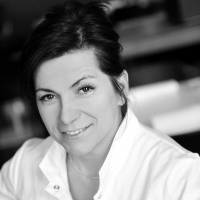 From Wallonia, Arabelle Meirlaen, was named Lady Chef of the Year 2008 and holds one Michelin star. Finally, from Brussels, Yves Mattagne, is holding two Michelin stars from 1997 in his Sea Grill restaurant. Each has also received a prize from the Club in past. 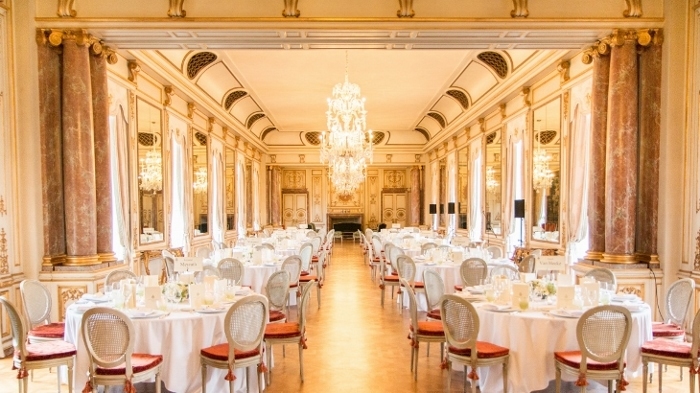 The gala dinner, under the patronage of Mr. Didier Reynders, Deputy Prime Minister and Minister of Foreign Affairs, took place in the sumptuous Mirror Gallery of the Egmont Palace [photos][menu]. Yves Mattagne, began his career, after his military service with the Belgian Navy, in the kitchens of the Hilton International Hotel Brussels. After spending 3 years at the Hilton Brussels, he changed to the Hilton International Gatwick where he stayed 2 years and became chef of the gourmet restaurant. Back in Belgium, he worked with Mr Beyls, a well-known Belgian chef, at the "Orangerie". He then spent 8 months at "Divellec" in Paris to prepare for the opening of the Sea Grill restaurant, where he has been head chef since January 1990. In 1991 Yves received his first Michelin star and the second arrived in 1997. In 2010 Yves became the owner of the restaurant. Arabelle Meirlaen creates in her open kitchen, a living food that makes a feast of the senses! From childhood she listened to this little voice of inner wisdom that inspired her: "Listen to life, the seasons, your body. You have the power to feel what is happening in you, what is right and good and how to convey your identity to your customers." Knowing that nutrition has a fundamental impact on health, especially our "second brain", the belly, she is interested in the natural virtues of plants, organic products and created a vegetable garden. In her restaurant, she achieves the perfect harmony between a warm welcome, tasty, balanced dishes, gently cooked upon request, sublimated by a choice of elegant and fruity wines selected by Pierre Thirifays. 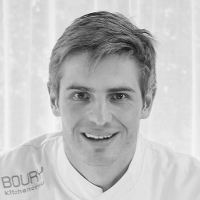 Tim Boury, and his wife Inge Waeles founded restaurant "Boury" which opened its doors in 2010 after a thorough renovation of an aristocratic townhouse in the city centre of Roeselare, 120km west from Brussels. Tim and Inge met each other in the kitchen of "Comme chez Soi," where they both worked as "chef de partie." Later, Tim was the left-hand and sous-chef (for 5 years) of the former 3-Michelin star chef Sergio Herman (Oud Sluis), whereas Inge worked with chef Peter Goossens at "Hof van Cleve." Only one year after the grand opening, the Boury team was rewarded by Michelin with a first star. In 2014, Tim was elected "Young chef of the Year 2014" by Gault & Millau who scores the restaurant 17/20. In 2016 the restaurant moved to another location (also in Roeselare) where guests have the possibility to stay in one of the guestrooms, enjoy drinks in the garden or in the bar, or to make use of the conference facilities. Following the move, Tim was elected "Chef of the Year 2017" by Gault & Millau and the team received a second Michelin star. The symposium explored different aspects of Belgian gastronomy, including its history and its place in Europe and the World. Interpretation between French and English was provided. Peter Scholliers studied history at the Vrije Universiteit Brussel and obtained his doctorate in 1984 at the same institution. He conducts research on the history of social inequality, living standards, nutritional history, the history of wages and prices, and material culture from 1800 to today. He lectures on these themes at the VUB and, occasionally, at the Università di Scienze Gastronomiche (Bra, Italy). He is a professor and is vice-chairman of History courses in the Department of History of the Vrije Universiteit Brussel. He is co-editor of Food & History and Appetite, and member of the board of "Food and Foodways", and "Food, Culture & Society". Geert Van Hecke is a former student of the Hotel School Ter Duinen in Koksijde. He worked in the kitchens of La Villa Lorraine, and La Cravache d'Or. His master was the French Chef Alain Chapel, who left an indelible impression on Geert's culinary development. In 1983 Geert opened his restaurant De Karmeliet in Bruges. 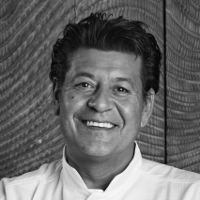 In 1985 he acquired his first Michelin star, his second in 1989 and his third in 1996. In 2016 he closed De Karmeliet and opened in 2017, "Zet'Joe by Geert Van Hecke". At the end of 2010, Geert was appointed a knight in the Leopold Order. Jean-Pierre Bruneau opened his restaurant "Bruneau" in 1975 and was awarded a Michelin stars in 1977. Followed a second star in 1982 and a third one in 1988, which he kept until 2004. Jean-Pierre was one of the first chefs to honour vegetables in fine dining. On 22 January 2018, Jean-Pierre Bruneau officially closed his restaurant, for a well-deserved retirement. Jean-Pierre trained many chefs who now have their own restaurant, some with Michelin stars. Andy Hayler is the author of “The London Transport Restaurant Guide” and is a freelance food writer for various publications. He was a guest critic on the first four series of BBC’s “Masterchef: The Professionals,” and he wrote the Paris section of National Geographics’s “Food Journeys of the World,” published in 2009. He is the restaurant critic for Elite Traveler magazine.Over the last 20 or so years he has been eating in restaurants three to six times a week. In 2004 he completed eating at every 3 star Michelin restaurant in the world at the time, a journey that was reported in the press as far afield as Taiwan and Australia and made it to French National TV. He caught up with Michelin in 2008, and again in 2010, 2012 and 2014 in terms of eating at all the three star restaurants at that time. "Taste professor" Peter Klosse has been the owner of Hotel de Echoput (Netherlands) since 1986. In 2004 Klosse obtained his PhD at the University of Maastricht with his thesis on taste and taste classification. Peter spent years researching the roots of gastronomy and founded the "Academie voor Gastronomie" in 1991 to transfer his knowledge of wine-food to chefs and sommeliers. Peter wrote many books about taste and is lecturer of gastronomy at Zuyd University in Maastricht. Marc Declerck is the Managing Director of Gault & Millau Belgium. He was one of the co-founders of Gault & Millau Benelux in 2003. Chemical engineer by training, Marc led various roles in academia and industry and spent an important part of his career as a private banker. Marc is also a fine gastronome. Copyright © 2004-2019 - Royal Club of Gastronomes in Belgium. All rights reserved. Site design by FP. The Royal Club of Gastronomes in Belgium is a non for profit association.